So Camden Cyclists admit that Royal College Street isn’t “truly Dutch” (though they still claim it has “gone Dutch”). They are wrong to claim this, and I’ll explain why. 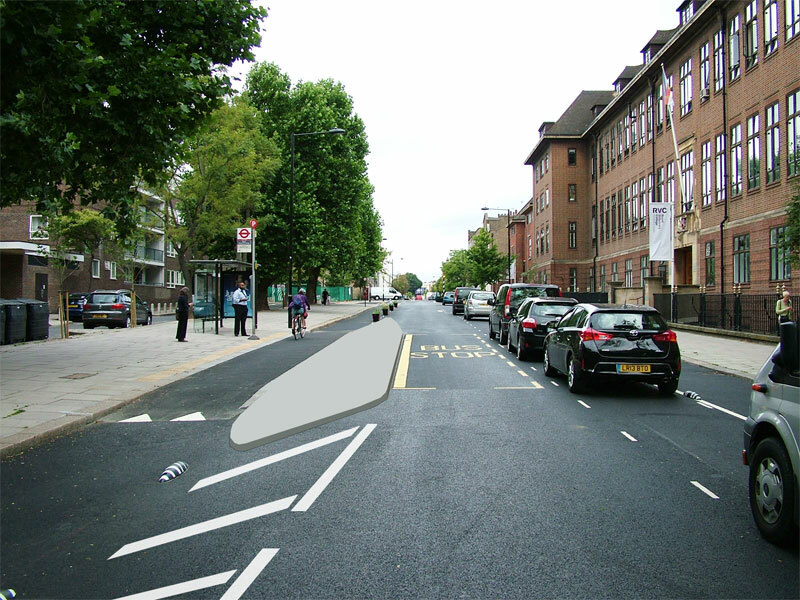 Looking at the new design, the cycle lanes do look pretty generous. Two whole metres wide! (That’s a bare minimum for new Dutch infrastructure.) So the width ain’t bad. Looks wide, but is it really? Looks pretty spacious, doesn’t it! But there’s a problem, and it’s a biggie: you can’t actually use the whole track. 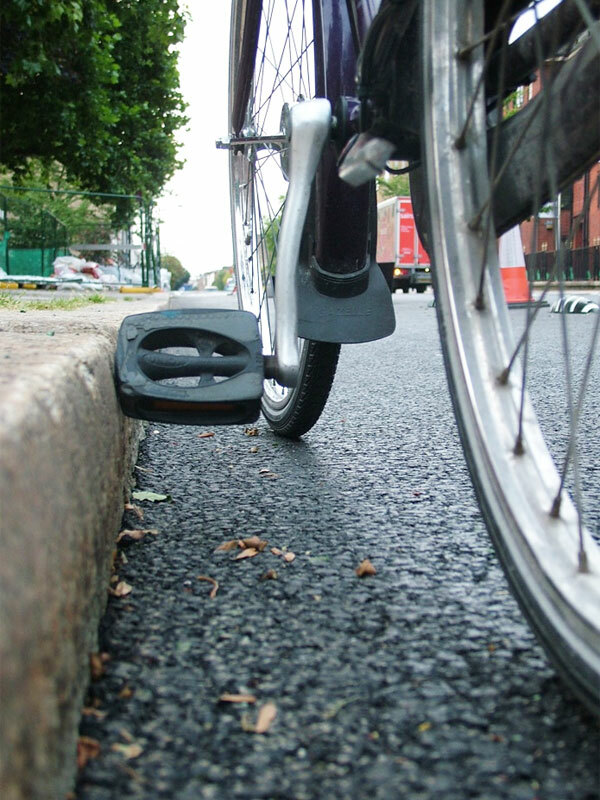 The issue is that the kerbs are steep and high – higher than your pedal at its’ lowest point. Ride too close and the pedal will whack the kerb, either on the side or on the top, and that won’t be nice. No bikes were harmed in the making of this article. 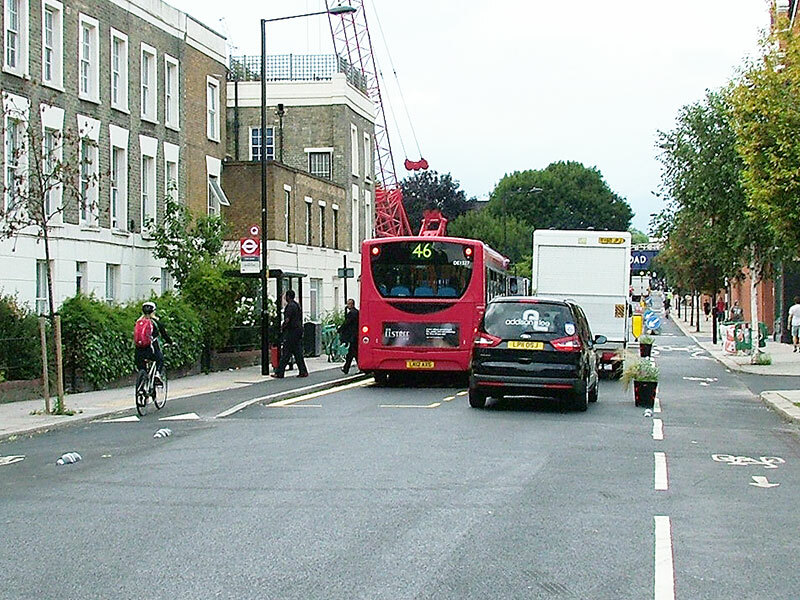 As a result, it’s just too dangerous to ride close to the kerb, so people tend to ride further out towards the middle of the lane. Because of this, there’s not that much room to overtake or ride side-by-side comfortably. It can be done, but you’ve got to keep your wits about you (to coin a phrase) and be careful not to wobble. Please forgive my cack-handed drawing of a person on a bike. Also: NOT TO SCALE! 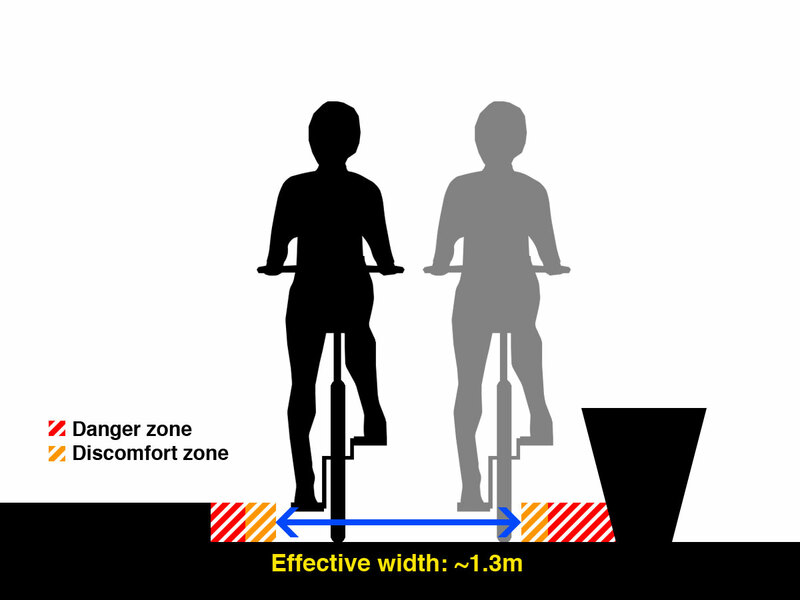 As the diagram above shows, the full width isn’t actually available to ride in. 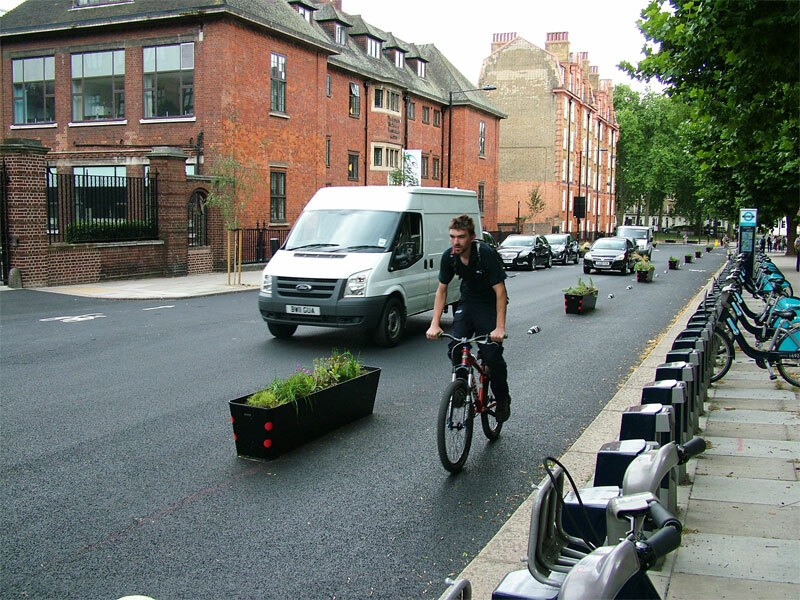 Get too close to either edge and your pedal will strike the kerb or the planter. Naturally, the closer to the edge one rides, the less comfortable one feels. While I was watching people ride along the new track, overtaking mainly happened while passing the armadillos – the overtaker can get close to them without hitting their pedal on a planter. So overtaking a single rider is possible, but it can be a little uncomfortable as there’s not much room for error. The entire width of the track can be used. Remember, the width of the surface is exactly the same as in the other diagrams above. Here, the cycle lane (or rather, cycle path, or – even better – cycleway) has been raised up halfway between the road and the path (or, to use more technical language, halfway between the carriageway and the footway), so the footway is about 75mm higher than the cycleway (this is known as the upstand). Also note the ~30º angled “forgiving” or “splay” kerbs, which are safe to ride against, as the wheel is gently nudged back into the cycleway. 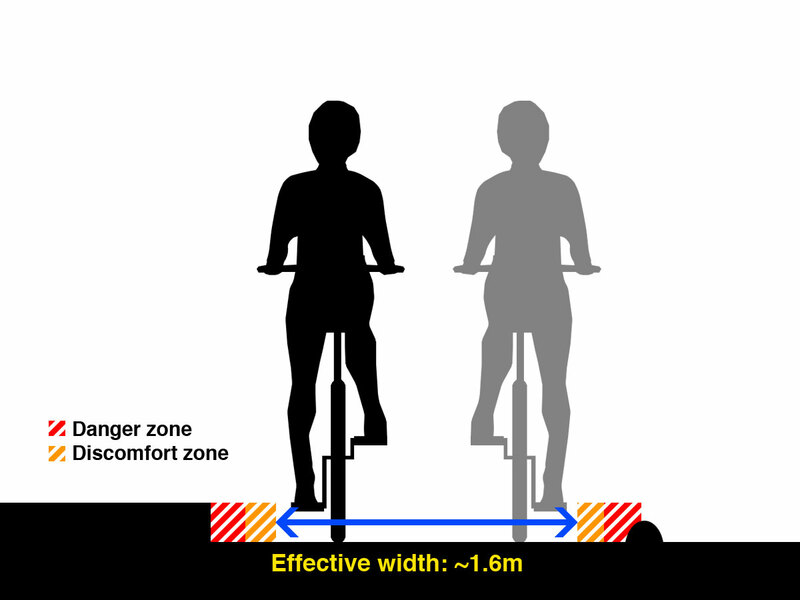 My diagrams may not be to scale with the outside world, but they are to scale with each other, and the Dutch-style cycle path clearly has far more capacity than the Royal College Street examples – even though the width of the surface, from edge to edge, is exactly the same width in all four diagrams. That “Dutch CROW standard” 2 metres (which, by the way, should be a minimum, not a target) isn’t being used to its full potential at Royal College Street – indeed, it can’t physically be used by the people who ride along it – and the experience of riding on a proper Dutch cycle path of exactly the same actual width would be quite different. I’ve only covered the northbound lane here. The southbound lane is even more tricky, as the right-hand barrier is a row of cars, so you can’t just leave the cycle lane for a few seconds and then rejoin. The discomfort zone is also very wide due to the risk of dooring. I’m going to cover this in another post, but for now, how would you overtake this rider if they were a little further back up the hill? I must have hit a nerve with my last article, because all manner of hoo-hah sprung up around it. Unfortunately, it was mainly on Twitter, which is a dreadful forum for debate. I’d much prefer it if people would use the comment form on the article for their thoughts, but it’s up to you I guess. Camden Cyclists say they disagree with my piece, which is fair enough, but have offered no factual criticism of my article as of yet. They did remove the phrase “truly Dutch” from their puff piece about Royal College Street, though there is still plenty of other nonsense. In addition to Dutch influence, they now also claim that “the armadillos are from Barcelona, the idea of using planters came from Vancouver and I understand that the bus stops are like some in Copenhagen” which made me laugh because none of those are Dutch cities or have the level and wide demographics of cycling that the Netherlands has. After all, why look to the best when elsewhere is cheaper? The page also says “we have observed that some cyclists prefer to change the vehicle lane or to overtake the bus” which, despite being a bit mangled, says to me that the scheme isn’t working as well as it should be. When bike riders are choosing to ignore your brand new space for cycling and mix with the cars and vans on the main carriageway instead, there’s something wrong. In desperation, they’ve taken to Streetview and found two examples of similar bus stops, one of which does look even poorer than the ones on Royal College Street. Trouble is, the one in Den Haag has an admittedly rather narrow, but still useable (maybe 1.5m-wide) bus stop island! The photo from Copenhagen seems to have been sourced from the roughest part of town they could find. I don’t remember Copenhagen looking that tatty. Camden Cyclists also recently suggested that we stop discussing this online and meet in person instead, which I suspect is a way of saying they’d rather keep criticism out of the public eye. I fell for this let’s-meet-up ruse once before and ended up in a conference room listening to Hackney LCC’s Oliver Schick drone on and on (and on and on) while nobody else could get a word in edgeways. I’ll never get those hours back, you know. Anyway, what’s wrong with discussing things online? I think it’s great. It gives you time to research each answer, study and prepare your evidence, and present it in a way you feel puts the case forward clearly. The Web is the perfect place to have this discussion, and I don’t intend to stop having it here. It’s 2013, get used to it. Since writing the article on Friday I’ve been in bed with flu. Yesterday I was feeling a little better, and I fancied some fresh air and a view of something other than the walls, so we took a short walk to the park. In my weakened and slightly groggy state my walking pace was glacial, and suddenly London was a much more difficult place to be in. Zebra crossings felt especially stressful and dangerous – impatient drivers would pass close behind us while we were still on the crossing. The experience gave me some small insight into what it must be like to have restricted mobility, and I can see how stepping off a bus and seeing bikes approaching could be very stressful. It underlined to me that I was right to criticise the bus stop arrangement on Royal College Street. I wonder what blind, disabled and elderly campaign groups think about it? Still no answer is forthcoming about all the extra space which magically appeared between the southern bus stop and the parked cars, or between the second bus stop and the southbound cycle lane. Where has all the extra room for motoring come from? It wasn’t on the plans or the visualisation. It’s big enough for motor vehicles to pass through. Why are people defending the council for prioritising car travel at the expense of walking, cycling and public transport? Camden Cyclists, ever the apologists for the Council, describe this as “a little extra space”. A little extra space?! A LARGE VAN CAN PASS A BUS AT THE SECOND BUS STOP! That is not “a little extra space”. Stop apologising for the Council’s mistakes and start sticking up for what’s right. You’re meant to be a cycling campaign not the council’s mouthpiece. They go on to say there’s “about 1m [extra space] at the southern [bus stop]” right below a photo of the bus stop in question, showing that there’s at least twice as much. Am I the only person round here with a tape measure? 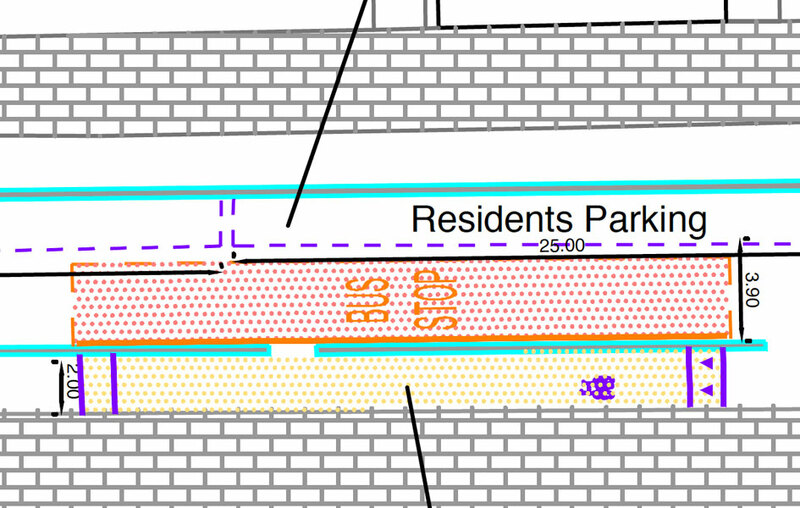 Why were Camden Cyclists so keen to defend the new layout when it clearly didn’t match the plans? Why were they so keen to write off the passing taxi as a “skinny car“? And why do they still down-play the issue? LOOK AT THIS PHOTO AGAIN. Cars and vans pass freely while people on the bike track wait. Is that what 10,000 people protested for in the pouring rain? It’s pro-car business as usual. Where did all this extra space come from? Aren’t Brian Deegan and co. paid tens of thousands of pounds of public money each year for this sort of thing? Don’t they have a tape measure? Was there some secret diktat from above which insisted cars should be able to pass stopped buses, or was it just a surveying balls-up? We deserve to be told. I’m not saying this is a truly terrible scheme (like Bethnal Green Road, gosh no) but it is a disappointing scheme compared to what it should be, and it certainly shouldn’t be held up as a shining example of cycle infrastructure when there are so many things wrong with it (each of which I’ll be explaining clearly, of course!). I didn’t set out to rubbish Royal College Street. When I heard it was very nearly finished I rode up there with excitement, but when I got there my heart sank the more I saw of it. I’m just one person writing their personal opinion on a personal blog. I try to be as honest as possible and tell things like I see them. Maybe that’s why I upset so many people. Oh, and finally – if you must have a pop, do it on here, Twitter’s doing my head in these days. Ta. 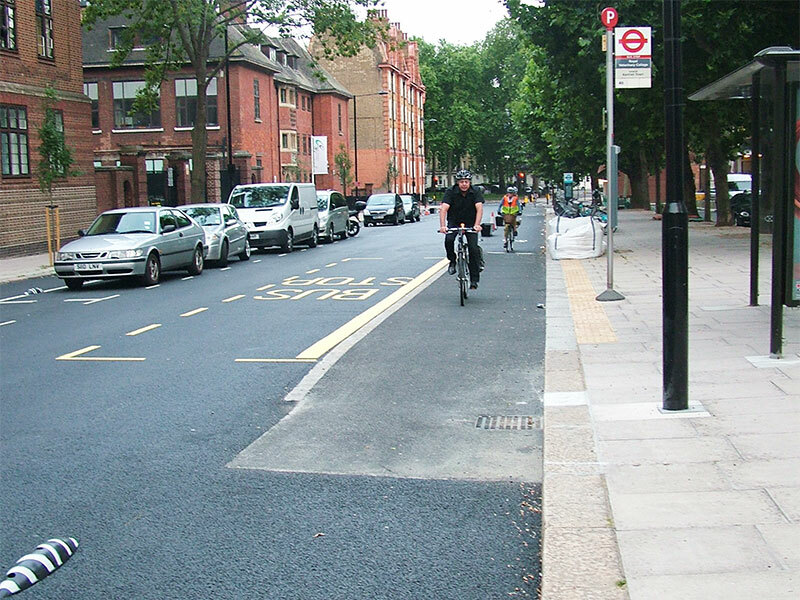 The new Royal College Street layout is still not finished yet, but having seen the plans and seen the parts which are finished I think I should let you know about Camden’s flagship cycle scheme. My conclusion: it’s not very good. 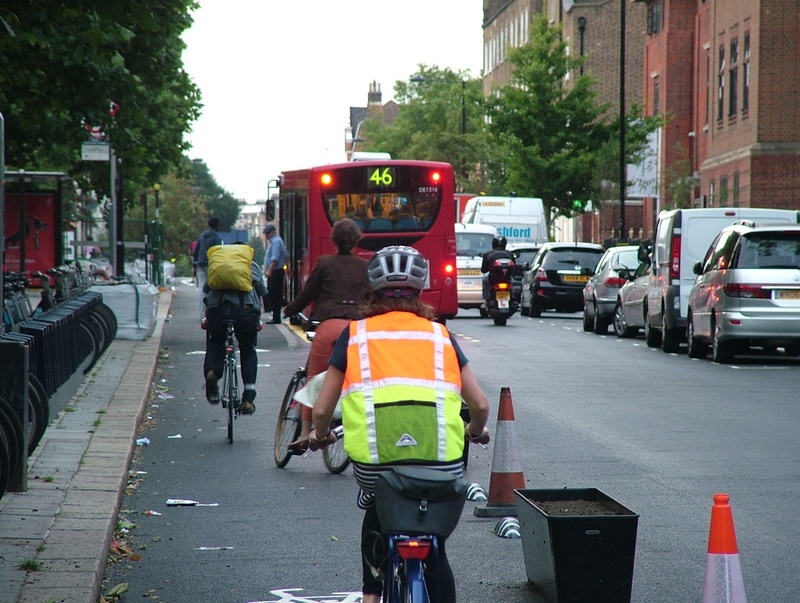 It’s certainly not “truly Dutch” despite what Camden Cycling Campaign say. Don’t get me wrong – it’s better than 99.9% of other roads in the UK and I’d much rather cycle here than almost anywhere else in Britain – but that really is faint praise, as almost every other road is truly dreadful. The annoying thing about Royal College Street is that it’s essentially new-build. The whole road has been resurfaced and had a new layout applied, so there’s no excuse for rubbish here. But there are so many flaws it’s difficult to know where to start. So why don’t I start with the bus stops? They’re certainly nowhere near Dutch standards (this is what Dutch bus stops actually look like). There are several things wrong here. The obvious problem is that despite there being plenty of space here, bus passengers and bike users are put into direct conflict, as people boarding or alighting the bus stand in the cycle path. The woman riding a bike here has illegally veered onto the footpath to avoid this conflict. This really, really is not Dutch. This was never going to be Dutch. As you can see, the original plans show the bus stop filling the width of the carriageway, forcing motor vehicles to wait behind the bus while it is stopped. But in reality, the road here is much wider, wide enough for a car to overtake a stopped bus. Brian Deegan (who was head of the scheme until he moved from Camden Council to TfL) also discussed it, insisting that cars did wait behind stopped buses, although he conceded that he hadn’t actually been to look yet. He also said that Royal College Street was “tighter to the north” which isn’t entirely correct either. 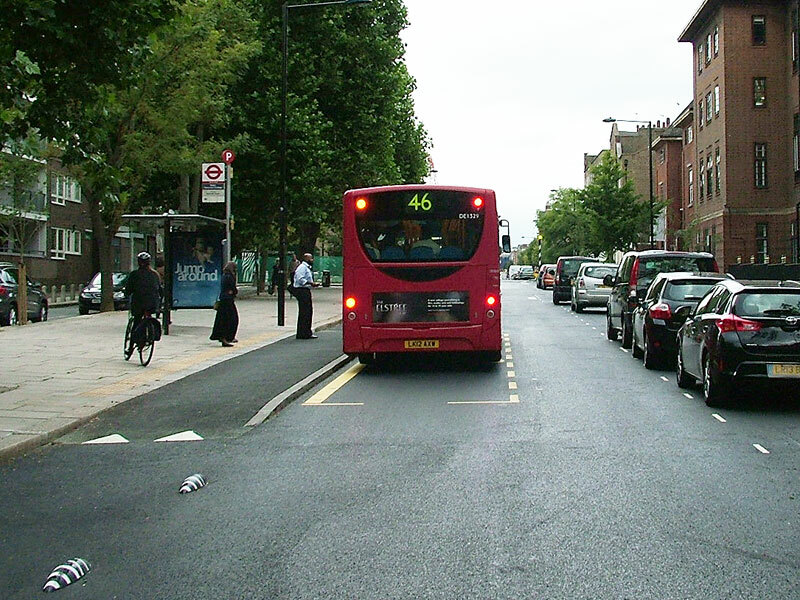 It is true that the entire road width is narrower, but due to having no parking spaces the carriageway is actually wider and even large vans can pass buses here! So, while the van and taxi pass the stopped bus, the bike rider on the left has stopped while the bus passengers cross the cycle track to reach the narrow footpath. Does that seem like prioritising walking and cycling to you? Because it sure doesn’t look like it to me. It looks like business as usual, prioritising private motor vehicles while patting cycling on the head (along with walking and public transport). Just after I took the photo above, another rider chose to leave the semi-segregated cycle lane and follow the cars, passing the bus on the right-hand side rather than come to a stop until the cycle track was clear of bus passengers. I understand why he did this – why lose all your momentum when there’s clear space to proceed? – but he shouldn’t have had to make that decision. People on bikes shouldn’t be faced with a choice of choosing to be safe or choosing what’s convenient. Good cycle infrastructure is both safe and convenient. So that’s what I think of the bus stops on Royal College Street: they’re crap (or poor, or second-rate, or sub-par, whichever you prefer) and they force bus passengers and bike riders into conflict, while giving motor vehicles the red carpet. Further to this, it must surely be stressful for people with visual or mobility difficulties to step off a bus into a stream of passing bikes, or to step in front of on-coming bikes when the bus pulls in. And what’s more is, there’s no need for this conflict whatsoever. We know how to do it right, and shouldn’t be building in conflict like this. If the street was extremely narrow then maybe I could sympathise, but it’s clearly not. There are other things wrong with Royal College Street – the high kerbs massively reduce the effective width of the cycle tracks, and at one point the track turns into an advisory lane which then disappears altogether – but I’ll save them for another post. This isn’t what I expected when we asked London to “Go Dutch”. Footnote: I wonder if Brian Deegan has been on David Hembrow’s Study Tour? I think he really needs to see what good cycle infrastructure really looks like.